I'm reposting this review as it still holds true. 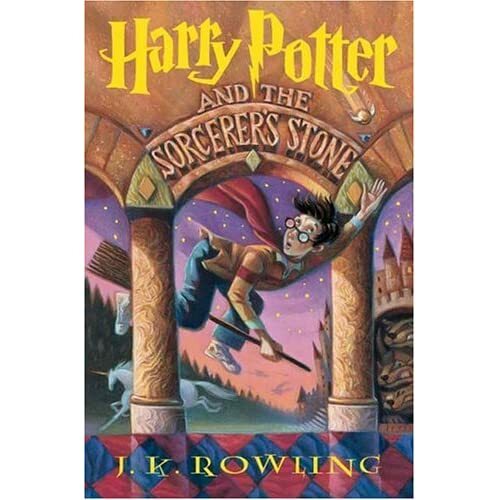 I reread the first Harry Potter and loved it just as much as the first time. Favorite scene: Diagon Alley, you can just see the wondrous shops and Harry enchantment. I love that moment! Favorite character: Hagrid. He's just such a character in this book. And I loved seeing him on the movie screen. Didn't notice (or didn't pay attention) to the fact that Hagrid borrowed the motorcycle at the beginning from Sirius Black! I probably thought it was just another name when I read the first time. I feet sorry for Petunia Dursley. As nasty as she is, I can't help that think that everything she's done has been because she's jealous of Lily. Maybe if she had more love, or acceptance, or a talent than she wouldn't have turned out so urgh! How much foreshadowing is there when we meet Professor Quirrell? Good graciousness! And that story that he met a vampire... yeah he met a vampire, named Voldemort! The password for the Gryffindor tower was "pig snout." Awesome!!! Overall, I just adore this movie. It's the closest movie to book transition. It brings the world to life. Much lighter than the later movies, but the first book is much lighter anyway. The set pieces are just amazing. I couldn't have pictured Hogwarts better in my mind. And the icing on the cake: the final lines of the movie about Harry not going home, not really. So much better than the ending of the book. Kudos to the film makers. Diagon Alley -- All the shops! All the things! The introduction of all the wizards in the background. Such detail! Sorting ceremony -- All those kids! All those nervous, excited kids! And the way that the sorting hat talks to Harry is priceless! Christmas at Hogwarts -- It's just too pretty. More scenes with the ghosts. They severely underused the genius that is John Cleese in the movie! The ghosts are great; the little intrigues and mysteries are so much fun. And Peeves should have at least made an extended appearance. Charlie and the escape of Norbert the dragon.